Click here to Email Snoopers. 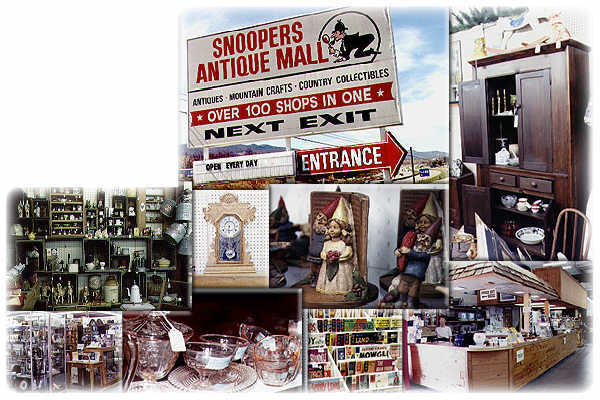 Snoopers Antique Mall features over 100 antique dealers! If you love collectibles, you're sure to find that hidden treasure at Snoopers Antique Mall! From Cairn Studios / Tom Clark Gnomes to fiesta ware, pottery, antique furniture, seasonal flags, collectible magazines, musical instruments and NASCAR afghans, you'll learn to be a Snooper! Snoopers is located in Southwest Virginia easily accessible right off Interstates 77 and 81 at exits 77 or 80. Snoopers is the perfect place to stop, get out of the car, stretch your legs, and refresh yourself. We have clean restroom facilities, and a snack center to make you feel at home. Our location within minutes of Wytheville is ideal for the overnight traveler, with over 20 motels, over 40 restaurants, some of the most beautiful scenery in Virginia, and friendly, helpful people everywhere! Come see us!